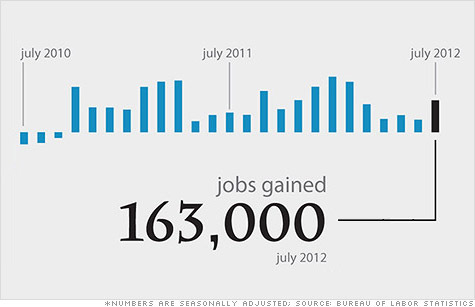 Employers said they added 163,000 jobs in July. NEW YORK (CNNMoney) -- Businesses stepped up their hiring in July, but the unemployment rate ticked higher anyway. Employers said they added 163,000 jobs in the month, according to a Labor Department report released Friday, much better than the 95,000 jobs economists had forecast. But at the same time, the unemployment rate unexpectedly rose to 8.3% as households claimed they lost 195,000 jobs. The government's monthly jobs report comes from two separate surveys: one that looks at employer payrolls, and the other which questions households. Those two reports went in opposite directions in July, confusing the overall reading on the job market. "There are two sides of this report, and unfortunately both sides are not telling us the same thing," said Ellen Zentner, senior U.S. economist for Nomura. "This is a report showing the economy expanded at a greater pace in July than in June, but households are still telling us they're in pain." The household survey showed 150,000 people dropped out of the job market. About 852,000 "discouraged workers" were not counted in the labor force, because they did not look for a job in the last four weeks. The so called "underemployment rate" rose to 15%, its highest level since January. That includes people who are unemployed, as well as those who are working part-time because they can't find full-time jobs, and those that have looked for a job sometime in the last year. According to the employer survey though, hiring picked up at a strong pace, but the quality of many of those jobs is questionable. Some of the biggest gains were at restaurants and bars, which hired 29,000 workers. Auto factories also hired 12,800 workers, but that improvement could be misleading given seasonal adjustments that may have artificially inflated the number, economists said. "That's a temporary boost that comes in July and won't be there in August," Zentner said. Temporary firms continued their hiring streak, creating 14,100 jobs in July. "We're seeing the temp hiring is a permanent trend," said Kathy Kane, senior vice president of talent management at Adecco Group North America. "We're hiring across the board in all industries." Kane noted that the demand for temp workers with finance, technology or health care experience in particular is so strong, the firm often has trouble finding enough qualified applicants. That skills mismatch may be part of the reason households are still so discouraged, she said. "I think you're seeing a lot of people feeling the pain of what's going on right now," Kane said. "We're having this political divide, blaming and fingerpointing each other about how to bring jobs back. The reality is we're not bringing back the jobs we lost. The jobs of the future are new jobs." The education sector was a bright spot, adding 19,100 jobs, as was health care, which added 12,000 jobs. Meanwhile, the public sector continues to be a drag on overall hiring. The government cut 9,000 jobs in the month, including cuts at the federal, state and local levels. The job market has a long way to go to climb out of the deep hole left by the financial crisis. Of the 8.8 million jobs lost, only about 4 million have been added back. Three years after the recession officially ended, roughly 12.8 million Americans remain unemployed, and 40.7% of them have been so for six months or more.